This music is essentially about loss and remembrance – it could be a lost love, brother, sister, close relative or indeed loss in conflict. As well as being a professional musician, I also work as a civil funeral celebrant and this suite brings together both areas of my work. The inspiration has been not just my own experiences of grief and loss, but also the many families I have met and worked with over the years, the services we have put together and the different stages of bereavement experienced by them. The death of someone close to us immediately brings us feelings of sadness, pain, shock, chaos and disbelief. In this movement, I am trying to create the essence and pureness of a person’s spirit and although it is sad they are no longer a visible part of our lives, as the piece moves into a major key, there is joy in their spirit being set free from pain and suffering. A time of sad reflection and isolation when you realise the true magnitude of loss and the focus is on memories of times gone past. In this movement, we are thankful in the knowledge that by remembering them, those we have lost will always be a part of us. At the end of this movement is the poem, followed by The Last Post which has always been a part of Remembrance Services everywhere and during my brass band days many years ago, I played it many times on my cornet, always feeling the poignancy and seeing how it moved people. Now is a time of acceptance and hope – let us not despise death, but be well content with it, since it is one of the things that nature wills – being young and growing old, bearing children and reaching maturity, experiencing the seasons of the world and the seasons of the heart, so also is the end of life. If you would like to buy the live recording of my performance in Gloucester Cathedral on Sat 11th August 2018, it is available as a CD by post or as a download from Bandcamp. 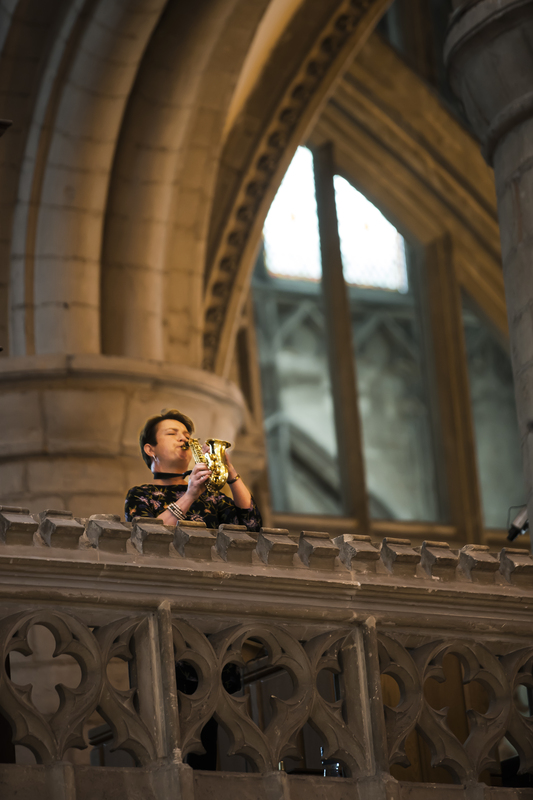 A live recording of a performance of In Remembrance - a Suite for Soprano Saxophone and Church Organ composed by Patsy Gamble and performed by Patsy on saxophone and Jonathan Hope on the organ at Gloucester Cathedral on Saturday 11th August 2018. Price includes first class post and packing.